The Lance Design ADX series of audio products use standard Ethernet as the audio transmission medium, utilizing either Audinate Dante or Cirrus Cobranet protocol. Ethernet is a natural for low-cost, high-performance fiber transmission, eliminating specialized devices. The network concept allows much more flexibility than point-to-point systems. The network can be easily extended to multiple locations; locker rooms, sidelines, press areas, announce booths, etc. Almost any configuration imaginable can be implemented with ADX 'building blocks', and the system is easily expandable as requirements change. The ADX system is designed to be easy to use in field environments, with setup and configuration very simple and straight-forward. Because Ethernet is 'packet-switched' transmission, the signals are self-routing. The only connection required is the Ethernet network, and so long as the network connection is there the mics, ifbs, talkbacks and PLs will all be reliably transmitted to where they are supposed to be with the highest quality, low-latency, best sounding audio in the industry. Dramatically fewer circuits to setup and fax means dramatically reduced setup time and effort, with consistently clean, great sounding audio. 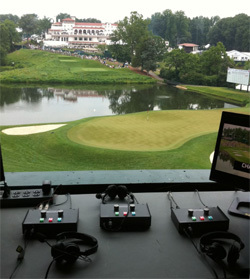 Lance Design is a pioneer in the application of networked audio to the remote broadcast industry, having developed our first system in 2003. Bill Lance's long experience in hands-on remote engineering brings 'real world' sensibilities to his designs, with a strong emphasis on reliability and simplicity. All 'wetters' and conversion electronics for the IFB and PLs are self-contained, making the ADX system perhaps the most compact, low cost, and hassle-free system available. Please take a look at the system examples, or call Lance Design with your requirements.